After a long paddle, we all just want to hit the margarita bar and throw the equipment on the racks and take off with the gang. Here's my takepart Valley tossed like lumber into the back of my Chevrolet van. The seats are all in, but the rear couch has been removed. I did not take the time to appropriately stow the boats in the individual sleeping bags, but instead stuffed the sleeping bags and grear around the kayak. The little red washer, bolt and nut box is there--I used only a traditional 17mm ratchet (without extension) to successfully make and unmake the sectional. About 15 minute job to make it at water's edge. I will post exact measurements of each section to give those of you contemplating a multi-piece kayak some idea if it will fit in your vehicles. 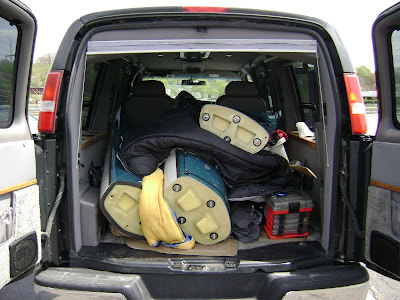 It clearly does fit in a full-sized van with room to spare, and soon I will try with both sectionals in the same van. It fits wonderfully in my Chevrolet Avalanche truck bed, and would fit in any full sized pickup truck. Thank you for a very interesting blog. Your blog have inspired me to try turn my homebuilt kayak in to a sectional. The kayak I have built is a Njord, designed by Björn Thomasson (http://thomassondesign.com/choosing/my_kayaks/njord.aspx?culture=en). The total weight of the kayak is 37.5 ib so it shouldn't end up to heavy. I have never seen a sectional kayak live so I wonder if you would be fine with me asking for some ideas and advice along the way?